Activities of 'VisAGeS' - a research team jointly affiliated to INSERM (National Institute of Health and Scientific Research) and INRIA - are focused on computational modelling of pathologies of the central nervous system. The team addresses a number of general problems: the conception of the surgical room of the future, achieving a better understanding of normal and pathological behaviour of the brain and other organs, and the promotion and support of virtual organizations of biomedical actors by means of HealthGrid technologies. New in vivo physiological sensors are making it possible to acquire complementary anatomical (structural) and physiological (functional) information from patients. However, this increase in the quantity of information available for purposes of diagnosis and treatment is only of benefit if researchers and physicians are able to interpret it meaningfully. Traditional methods of using these data are often sub-optimal, implying that much valuable information is still neglected during medical decision processes. In this context, we are focusing our efforts on producing new processing algorithms in the field of neuro-informatics and clinical neurosciences. This involves the development of computational modelling procedures in medical image computing, computer-assisted interventions and the management of distributed and heterogeneous neurological information. We focus our medical application objectives on pathologies of the central nervous system, with a particular effort on multiple sclerosis (MS) and image-guided neurosurgery. Figure 1: Volumetric representation of sulci from the central region with the representation of somatosensory activation acquired on MEG. Today, magnetic resonance imaging (MRI) is widely used for disease diagnosis, patient follow-up, monitoring of therapies, and more generally for the understanding of the natural history of MS. MRI allows abnormalities in MS to be seen with high sensitivity, but is non-specific. Clinical observations are inherently subjective, show poor inter- and intra-observer reliability, and have limited sensitivity. These drawbacks are particularly critical when dealing with hundreds of subjects as in clinical trials. On the other hand, such large-scale studies, involving multiple subjects, image modalities, time points and acquisition centres, naturally require automated image-processing pipelines for the efficient computation of MR biomarkers from spatio-temporal and multiple MR sequence images. Figure 2: Registration of intraoperative ultrasound with pre-operative MRI. It is expected that neuroimaging will play a critical role in defining in vivo MS lesion patterns. Making a distinction between MS lesion patterns, and between the early and late stages of MS, is important for a better understanding of the natural history of MS and even more for the appropriate selection and monitoring of drug treatment in MS patients. MRI has a low specificity for defining focal MS pathological changes, but allows highly sensitive detection of both focused and widespread diffuse pathologies in apparently normal white and grey matter. Some of our major ongoing research issues in neuroimaging of MS lesions concern the definition of new neuroimaging biomarkers for tracking the evolution of the pathology from high-dimensional data (eg MRI). This includes the use of imaging specific to white matter, like Diffusion Tensor imaging (DT-MRI); cell-labelling neuroimaging (eg from MRI or Positron Emission Tomography - PET); and the comparison of MR and PET data using standard and experimental MR contrast agents and radio-labelled PET tracers for activated microglia (eg Ultra Small Particle Iron Oxide or the selective peripheral benzodiazepine antagonist PK 11195). The ultimate objective is to develop cell-specific and quantitative imaging markers and thereby improve routine clinical in vivo characterization of MS pathology. 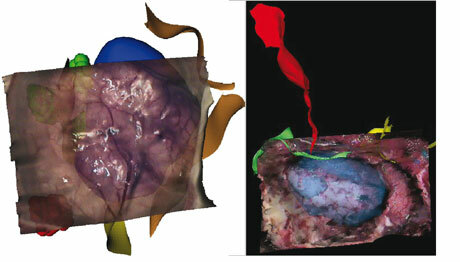 Figure 3: Surface based intraoperative reconstruction after dura opening (right) and tumor resection (left). Image-guided neurosurgical procedures rely on complex pre-operative planning and intra-operative environments. This includes various multimodal examinations: anatomical, vascular and functional explorations for brain surgery and an increasing number of computer-assisted systems situated in the operating room. Using an image-guided surgery system, a rigid fusion between the patient's head and the preoperative images is determined. Unfortunately, the assumption of this rigid registration only holds at the beginning of the procedure, since soft tissues tend to deform during surgery. This is a common problem in many image-guided interventions, but the particular case of neurosurgical procedures can be considered as a representative case. Brain shift is one manifestation of this problem but other tissue deformations can occur and must be taken into account for a more realistic predictive work. 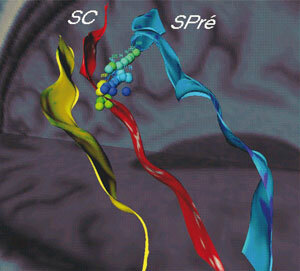 Figure 4: Combination of multimodal pre-surgical data outlining low grade lesions surrounded by fibers bundles (right: with fMRI markers as balls and sulci ribbons). To do so, one possibility is to deform the anatomical and functional images according to the estimated real deformation. This requires intra-operative imaging, and we have recently introduced 3D video reconstruction and 3D ultrasound (3DUS) as a possible intra-operative modality for neurosurgery. These modalities have a minimal effect on operating room logistics and are therefore readily accepted by neurosurgeons. Additional sensors will shortly be available in the operating room; among their functions are molecular data acquisition or in vivo 3D optical imaging and microscopy. Nevertheless, the integration of these new intra-operative sensors is nontrivial. As mentioned above, one of the most challenging aspects concerns the problem of image fusion between the intra- and pre-operative data, which includes the mathematical modelling of matter dissipation during surgery. Another issue concerns the temporal resolution of images, which is not always adapted to the deformations that must be estimated. For instance, intra-operative images cannot be continuously acquired since this would interfere too much with the operative conditions. This implies the merging of different observations gathered at different time scales during surgery (typically, video and 3D ultrasound or intra-operative MRI). For these two projects we are working within the INRIA international associated team NEUROMIME, which associates the Visages team with Louis Collins - group at the Montreal Neurological Institute of McGill University.